Russian strategists must be rubbing their hands with glee as they watch the West sacrifice its strategic and highly profitable relationship with Saudi Arabia all because of Jamal Khashoggi, knowing full well that their country is more than capable of replacing its rivals in every single sphere of cooperation that they pull out of with Riyadh, which would resultantly reinforce Russia’s position as the supreme “balancing” force in 21st century Eurasia. It almost looks at this point like the West wants Russia to replace its strategic role in Saudi Arabia, at least judging by the self-inflicted damage that they’ve done to their own interests over the past couple of weeks since Jamal Khashoggi’s killing in his country’s Istanbul consulate. The circumstances surrounding it are unclear, but it’s looking ever more likely that a hostile “deep state” faction was behind his murder just like the author surmised in his earlier piece titled “Khashoggi Mystery: Rogue Killers Or Rogue Royals?”, though that still can’t be known for certain. Even so, it’s interesting to observe how many Western countries and companies decided to pull out of the Kingdom’s upcoming Future Investors Initiative, which is regarded as the so-called “Davos in the Desert”. Even more stunning is the fact that many influential voices on both sides of the Atlantic are now calling for a suspension of their already agreed-upon weapons deals with Saudi Arabia, although Trump has thus far has been impervious to this pressure on the basis that one dead dissident isn’t worth sacrificing $110 billion worth of deals and potentially half a million jobs at home. The EU thinks differently, however, and Merkel announced that she’ll freeze arms shipments to Saudi Arabia as well as encourage her partners in the bloc to follow suit. All of this has combined to contribute to an environment of uncertainty where the Kingdom is no longer sure whether it can rely on its decades-long strategic partners, especially in respect to the military sphere. Trump will probably hold firm and do whatever he can to retain his country’s strategic relationship with Saudi Arabia, but the ruling royals must realize at this point that he could always change his mind depending on domestic political considerations, to say nothing of overall international considerations. The Saudis don’t seem interested in making the first move away from America but will undoubtedly find a way to asymmetrically retaliate if the US ends up sanctioning it after the midterms. Bearing this backdrop in mind, the only responsible thing for Saudi Arabia to do is seek to strengthen its much more reliable relationship with its newfound non-traditional Russian partners, with whom it’s in the midst of a fast-moving and full-spectrum rapprochement. Russia’s desire to become the 21st century’s supreme “balancing” force in Afro-Eurasia has seen it clinch a variety of military, energy, economic/investment, and diplomatic deals with Saudi Arabia in spite of the two previously being heated rivals during the 1980s War on Afghanistan and the early 2010s War on Syria, but both Great Powers have pragmatically matured to the point of understanding the need to turn the page on their storied relationship and start anew in the New Cold War. So close have they become in recent years that President Putin even agreed to provide Saudi Arabia with S-400 anti-aircraft missile systems, as well as Kornet-EM anti-tank missile systems, TOS-1A “Buratino” heavy flame systems, AGS-30 grenade launchers, and Kalashnikov AK-103 assault rifles during King Salman’s historic visit to Moscow in October 2017. It doesn’t matter much to Russia that most of these munitions will probably be used in the War on Yemen since Moscow supports the Saudi position and is solidly behind the internationally recognized Yemeni government of President Hadi, which it still backs despite his unpopularity and purely because of the international legal principle of being against the Houthis’ militant overthrow of his government. Russia, unlike Western states, doesn’t place any political conditions on the purchase of its military equipment such as prohibiting their use in Yemen since Saudi Arabia’s activities there aren’t under UNSC sanctions. Moscow has expressed concern over mounting civilian casualties and is in favor of a political solution, but it has no interest imposing its desired vision on any of the warring parties. Think what one may about that position, it’s nevertheless consistent with international law, for better or for worse. No resolutions were ever passed by the UNSC forbidding the sale of military equipment to Saudi Arabia, so while one may disagree with the ethics of doing so, there’s nothing “illegal” about it even though a convincing argument can be made that the entire War on Yemen is illegal and that the UNSC should have sanctioned Saudi Arabia and its allies because of it. Be that as it may, they didn’t, which is why Russia has no qualms about possibly expanding its weapons sales to Saudi Arabia to replace any contracts that the Kingdom might end up cancelling with its unreliable so-called “Western partners”, but it’s not all about Moscow making a quick buck. Russia considers “military diplomacy” to be part and parcel of its envisioned 21st-century “balancing” act, to which end it regularly sells arms to competing pairs of countries such as Armenia & Azerbaijan, India & China, and China & Vietnam in order to maintain the strategic equilibrium between them that could hopefully prevent one side from gaining an edge over the other and aggressively commencing a war because of it. This contrasts with the US’ position of deliberately benefiting one side at the expense of another in order to spark this scenario to the benefit of its preferred regional partner. Considering the Mideast’s complicated geopolitics, it makes sense from Russia’s perspective why its strategists would like to include Saudi Arabia in its “military diplomacy” network for replicating this model between it and Iran. Moving beyond the military realm and into the energy one, Russia and Saudi Arabia are already dominating the global oil market through their OPEC+ partnership, but this will increasingly come under threat as the US continues its rise as a formidable challenger to both of them. In regards to the economic/investment sphere, the large-scale exodus of Western participants from the forthcoming “Davos in the Desert” bodes extremely well for Russia because it allows the country’s businessmen to stand apart from the pack and draw attention to the fact that there aren’t any political strings attached to their prospective deals. This is extremely important because it could reassure Riyadh that whatever agreements it reaches with Russia would be respected no matter what happens inside of the Kingdom itself. “Sword Dancing” For The S-400s? Accordingly, it’s only natural that presidential spokesman Dmitry Peskov reaffirmed that “preparations for the visit of Russian President Vladimir Putin to Saudi Arabia are ongoing” after the Russian leader was invited to travel to the Kingdom by King Salman last year, where he last visited in 2007 when he received the prestigious Order of King Abdulaziz that was later also bestowed upon the likes of Obama and Trump. President Putin is probably holding off on his visit until a number of big-ticket deals are officially clinched between the two Great Powers to serve as a productive reason for him to go there, such as finalizing the S-400 agreement and possibly even winning the bid to construct 16 nuclear power plants in the Kingdom. Furthermore, given the intense backchannel diplomacy between Russia and Saudi Arabia over Syria, it can’t be precluded that President Putin might be waiting for the fruits of their efforts to lead to a breakthrough in the Arab Republic that he can celebrate with King Salman, though it’s unlikely that he’d allow the media to capture him on camera performing a “sword dance” like Trump did if he was invited by his jubilant host to do so. Russia is poised to reap the rewards of the West’s self-inflicted damage to its strategic and highly profitable relationship with Saudi Arabia, which has been unprecedentedly undermined by the killing of a single dissident even though they ignored the deaths of thousands of civilians in Yemen. The trans-Atlantic divide between the US and the EU couldn’t be sharper in this context because Trump is doing all that he can to resist “deep state” and grassroots pressure to cancel his country’s $110 billion arms deal with Saudi Arabia while Merkel is leading the way in trying to get all EU countries to immediately suspend their weapons contracts with the Kingdom. The unexpected political instrumentalization of these agreements has put Saudi Arabia on edge and prompted it to strengthen ties with its non-traditional partners in Russia instead. To its pragmatic credit, Russia hasn’t once interfered with any of the many controversial events that characterize Saudi domestic politics, instead consistently remaining loyal to its policy of political non-interference in domestic affairs unless the interests of its compatriots are at stake. 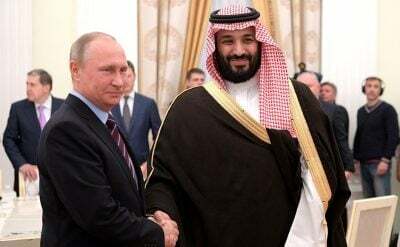 While this stance might have earned it heavy criticism in some corners for supposedly “turning a blind eye to Saudi crimes”, it’s nevertheless proven its strategic effectiveness by attracting Saudi Arabia’s attention as Riyadh seeks to replace many of its former “Western partners” with Russia after the sudden rift that developed between them. If the current trajectory continues, then the two Great Powers might very well be on their way to clinching a formal strategic partnership that could see President Putin travel to Riyadh as part of a victory lap for signing the most symbolic agreements.